In this lavish collection, a natural history of seeds is presented, illustrated with close-up photographs and scanning electron micrographs. With its studied narrative and beautiful photographic eye, this keepsake volume is a stunning tribute to the beauty and marvel of seeds. 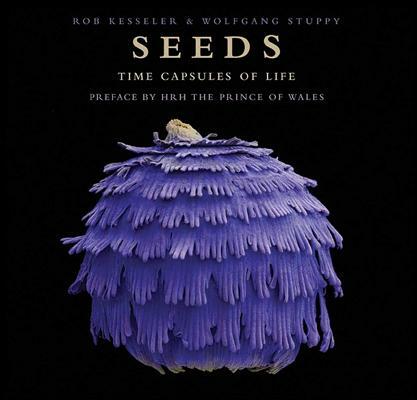 In this lavish collection, artist Rob Kesseler and seed morphologist Wolfgang Stuppy of the Millennium Seed Bank at the Royal Botanic Gardens, Kew, present a natural history of seeds, illustrated with close-up photographs and scanning electron micrographs. The images afford an unprecedented view into a most astonishing microcosm, where even the tiniest examples are exquisitely beautiful and sophisticated--in fact Kesseler's work has been called "mystifying," "astounding," and "awe-inspiring" by scientists and critics around the world. Seeds constitutes an essential source book not only for those fascinated by the natural world, but also for artists, designers, and anyone interested in the development of biological structures. This brand-new edition features a preface by HRH the Prince of Wales, himself an avid conservationist. With its studied narrative and beautiful photographic eye, this keepsake volume is a stunning tribute to the beauty and marvel of seeds. Seeds are the most complex organs plants ever produce. A major keystone in the evolution of land plants, the first seeds appeared some 360 million years ago. Since then they have developed into highly sophisticated propagules that have enabled plants to dominate the Earth's surface and conquer almost every possible habitat from the Antarctic to the hottest deserts. The diversity of shapes and sizes encountered in seeds is nearly endless and ranges from the impressive Seychelles nut at twenty kilos to the dustlike seeds of the orchids. No matter how small, packed into every seed is the complete genetic information needed to give rise to a new plant, whether it is a tiny herb or a giant rainforest tree. True time capsules of life, seeds may travel thousands of miles and, if necessary, wait for hundreds of years before germinating. Wolfgang Stuppy is the seed morphologist at the Millennium Seed Bank Project, an international initiative dedicated to seed conservation managed by the Royal Botanic Gardens, Kew. He holds a doctorate in comparative seed morphology and anatomy and lives in London.